For a python developer that has some experience creating android apps with java. I want to create a small app that access my university portal and retrieve some data to easy access it on android. 1) Which one its easier and faster to develop android apps? 2) Does Kivy has limitations to access certain parts of android (like not fully integrated with its api)? 3) And finally, an android app developed using kivy would run as fast as one developed using java? What is the preferred way to create rounded corners for buttons in kivy? Are there other equally viable ways to perform this task? Thank you. I am new to Kivy. i need to create a classic analog clock. My Question is: how to draw svg graphics into kivy canvas? How do you check for keyboard events with kivy? So, awhile ago, I started teaching myself kivy. I started with the main kivy website and went through its pong making tutorial and upon finishing that I decided to try and give it key input. I just can't seem to find any kind of guide to key input with kivy! Anyone know some kind of tutorial or can provide some easy to understand code? I did look at the Keyboard Listener in the examples folder of kivy, but I'm not quite sure how to use that if I'm supposed to. Very little is written about kivy, can you please tell me how good is kivy cross platform framework for Android? What Kivy tutorials and learning aids exist? Where is the list for Kivy? This is besides the pong tutorial on their website? After failing to find an answer in the web I began to investigate the files which generated the error: transformation.c, transformation.pyx and transformation.pyd. I also read a little about Cython. So, type(__pyx_t_3) == type(matrix_t) == double *. are of (double *) type. It looks like the compiler is not recognizing the type of matrix_t as a double *. I've just started diving into the Android world. I have a lot of experience programming apps in Python, so I've searching for a good combination "Android + Python", and I think I've found it: Kivy. I need to make applications that are able to download and upload content from the internet, maybe some connection with the map component included in Android and more stuff to make a nice Android app. But I really don't want to waste my time on something that maybe won't work. So, does anyone has some experience developing Android apps using Kivy? Is it really useful, simple, possible? Or is there a better option you have in mind? I'm new to android development, and I have had some experience with Java, C#, Python, etc. Python being my favourite, I'd like to code Android app with it. The most voted answers mentioned Kivy and ASE(which is now SL4A and includes PY4A). However, after some googling, I wasn't able to find any useful info about the difference between Kivy and PY4A. Searching for difference between Kivy and SL4A was fruitless, too. - What are the similarity and difference between them? - What are their good and bad parts? - Are there any other good alternatives? I'm having trouble getting Kivy to work with PyCharm on Windows 7. I've managed to add most of the external libraries through File > Settings > Python interpreters > Paths Tab. I think that the problem might by something to do with cython, as my file fails to recognise the kivy.properties file, which is of the Cython *.pxd format. If someone could please pointer me over to a windows config tutorial for PyCharm and Kivy or give me the solution to my problem, I would greatly appreciate it! Having read several Q&A's on SO, I realize that one has 2 options i.e. QPython and Kivy to do programming for Android, however, apparently both take different approaches. I am trying to validate my understanding and see if I am missing some key piece of information. QPython is used to create python scripts that can use wide range of modules, libraries, but they need QPython installed to be executed on target device. There is no way to package script into an apk. QPython apk has 2 version i.e. one for Python-2.7 and another one for Python-3.x. For Kivy, I'm not sure which version it is. QPython example script (HelloWorld.py) doesn't seem to behave as expected, from latest QPython-3.x from Market, on an Android Kitkat (4.4.2) system. I get the dialog to enter text, but then I expect a Toast to popup, but nothing happens. Get the impression that both QPython and Kivy are developed by a single developer each (or only one person is really active at present), and don't yet have a biggish community. [This is my biggest concern] I notice that there are 3-4 questions with 'qpython' tag on SO, and more than thousand with 'kivy'! Also get the impression that at this moment Kivy development is somewhat more active (perhaps quite active), but for QPython I don't have a clear picture. Kivy seems to be trying to expand the nature of application that could possibly be written using it, compare to QPython. There are API's like plyer and pyjnius that help expand the possibilities. Perhaps quite significantly, compared to QPython. Both QPython and Kivy seem to be heavily under development. Program (/ script) crashes (/ failures) seem to be reported on both set of tools. Overall, the opinion as a result (of above points) appears to swing in favour of Kivy, a bit more. Is the understanding correct ? Did I miss any crucial point ? This is not a rhetorical question, and I am looking for factual answers only. According to this post: https://groups.google.com/forum/?fromgroups#!topic/kivy-users/n7c3thksnzg, it is possible to use Eclipse as an IDE for Kivy through PyDev. However, I didn't understand the instructions. Can anyone please elaborate on how to connect Kivy with Eclipse. Note: I'm on a Windows machine. Also, is it possible to use PyPy instead of the Python Interpreter? I'm working on making a circle that will spin kind of like a large dial. Currently, I have an arrow at the top to show which direction the dial is facing. I'd like its behavior to be kind of like an old timey rotary phone, such that while your finger/cursor is down you can rotate it, but it'll (slowly) yank back to top after you let go. anchor_x: 'center'                          # this is /not/ centered. Parts of that are borrowed from the kivy touchtracer demo, and from this SO question. 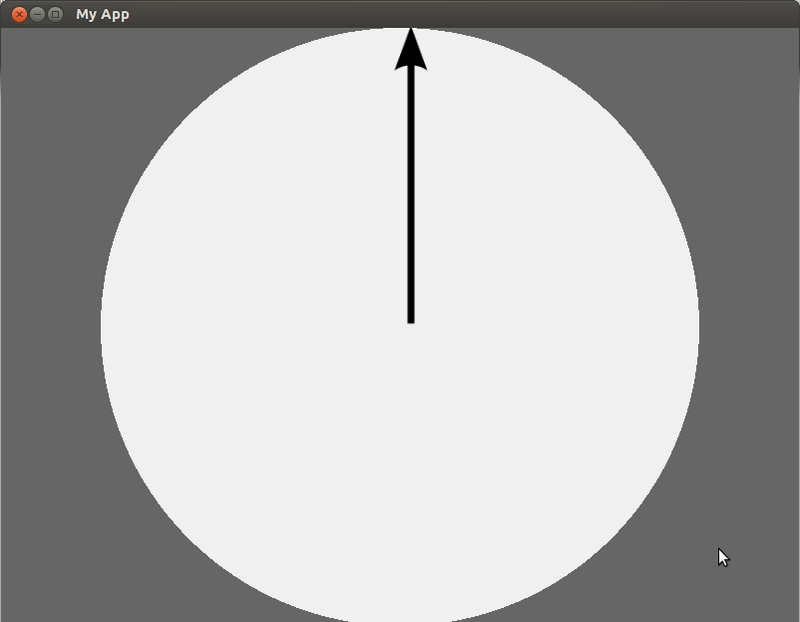 You can see I have a calculation that is correctly printing the angle between the origin of the circle and the touch event (not sure how this'll respond to multiple fingers, haven't thought that far through), but not sure how to integrate this into a "spinning" feedback event in the interface. I am trying to develop an email application in Kivy, basically just as an exercise to learn the in's and out's of the framework... I am trying to create the initial window and have reached a bit of a stumbling block! The idea is that it will simply display a list of emails in the inbox, much like any basic email app on a mobile device. The problem I'm having is that I can't figure out how to get the text of each list item (which is a just a button) to align properly. Using "halign='left'" in my button will make the text align left, but only relative to each button; it's still centered within each button. My actual app is a bit large to post, so this is a quick and dirty example I made from a stock Kivy example. (I realize this code isn't perfect... like I said quick and dirty for examples sake... it does work though!) So as you can see, the two rows of text on each button align with each other, but they don't all align overall. Can anyone suggest what I would do to make all the text align at, say, 10px from the left of each button? I did find one relative sounding item on StackOverflow, but it didn't really answer the question for example, it seemed to deal more with using images on buttons. I am new to Kivy, but I've read through the tutorials and documentation, as well as searched Google extensively - so any help would be greatly appreciated!